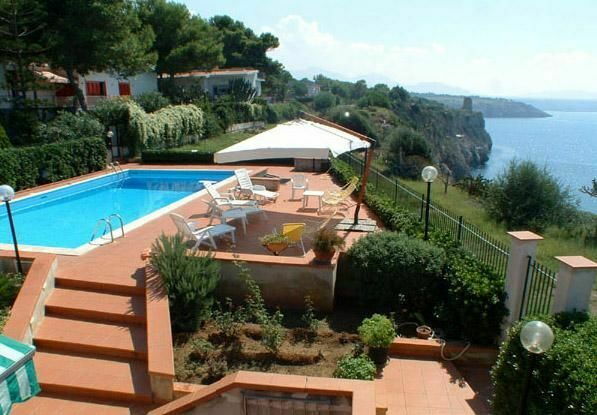 Beautiful villa, surrounded by large verandas set in a panoramic position along the high and rocky coastline of the Tirreno sea, in Terrasini area. The villa is situated within a protected area and has been furnished in a comfortable way with some handicrafts pieces. Distances: Terrasini with all kinds of shops at approx. 8 km, Terrasini’s beach at approx. 10 km, Palermo airport at approx. 15 km, the beaches are at approx. 100 meters. At guests’ disposal: well kept garden with an original cactus-plants’ collection, swimming pool (6m x 12 m – maximum depth. 3 meters – open from 01/05 to 30/09), large outdoor kitchen furnished for outdoor lunches and characterized by an original collection of majolica coming from all over the world, barbecue, wood-burning oven. Washing machine at guests’ disposal. Parking within the grounds. The villa has a direct access to the sea through a pathway and a stair which lead to a clearing overlooking the sea. The depth here is approx. 8 meters. 120 m2. Ground floor: living room with fireplace and panoramic view over the sea, kitchen (oven, dishwasher, refrigerator), double bedroom, 2 twin bedded rooms, bathroom with shower. Additional costs paid on site: Security deposit: € 300,-Final cleaning: € 100,-Heating: according to consumption Air Conditioning: to be paid on the spot according to consumption.